Once upon a time 3 young dads (who happen to have to have 14 little kids between them) combined a whole bunch of geeky high tech machines, some generous dollops of cuteness, a slightly loopy team of people and mixed them together with the world wide webby thingy. The result was amazing.... a comprehensive range of affordable, premium quality, designer personalised products for kids. All custom made and shipped to you in a jiffy. Chapter 1: The spare bedroom and a happy customer. Many years ago (well in late 2006) a happy couple, lets call them Mike and Rach (because that's actually their real names) set out on a little adventure selling really cute personalised children's products on a shiny new website which they named tinyme (.com.au). At that stage the business was run from a spare bedroom, which actually wasn't that spare because baby number 2 had arrived and the room was really quite small. There was lots to do, but fortunately Mike had a friend called Nick, and as the orders started flowing in, Nick helped to get them made and flowing back out. People started getting their orders and liked what they got. They started telling their friends and their friends started ordering too. "This is great" thought Mike," too many orders to handle. What a great problem! But what should I do? Maybe Nick could help out some more?" Chapter 2: Another spare bedroom and more happy customers. So Mike, being the good friend that he was, asked Nick to quit his job, mortgage the house and buy in. "Cool" said Nick, "I'll be right over" (actual wording and timeframes might have varied slightly). When Nick came over the small spare bedroom suddenly seemed really, really small. Unfortunately, the house Nick had just mortgaged was even smaller, had no spare bedroom and also had 2 kids running around in it. Something had to be done. Mike and Nick had a brain wave... "lets use the spare bedroom of our friend who has no kids". Fortunately their friend with no kids not only had a spare bedroom but also a state of the art production facility (known to some in the business as the spare garage). Things got busier. More happy customers, more orders, more happy customers, more orders. 2 months later baby number 5 arrived (Nick 3, Mike 2). Things got even busier! "This is great" thought Mike and Nick, "too many orders to handle. What a great problem! But what should we do?" Mike and Nick had met studying Industrial Design at university and were both into design, high tech machines, and making stuff (and raising lots of noisy kids in nappies). So thats what they kept doing. They also got some help and moved into a bigger place that wasn't a bedroom. It was a lot bigger. And so things kept going: More orders, more happy customers, more orders, more cool machines, more babies (Nick 3, Mike 3). This is great thought Mike and Nick. But soon the place that was a lot bigger wasn't so big anymore. They now had heaps of new machines and heaps of new staff and things were getting quite squeezy again. But what should they do? It was time to move again, so they did. "This place is huge" they thought as they unloaded trucks of gear and got things set up just in time for their 3rd birthday. 3 moves in under 3 years. By now the head count, the cool machine count, the customer count and the baby count had all gone up a notch (Nick 4, Mike 4). Occasionally, however, (as happens sometimes with 2 designers running a super fast growing business) Mike and Nick had a bunch of questions. Fortunately they had another friend called Ben. Ben had an MBA and worked at Goldman Sachs as a fund manager. Mike and Nick thought that sounded awfully clever so they would often meet with Ben and ask him all sorts of stuff. Fortunately Ben had four little children himself and was just as happy to talk about how cute the personalised children's products were as examine spreadsheets about return on capital (well, almost). With more space came more orders, more happy customers and more orders. The really, really big place started to fill again. Multiple shifts, more designers, web developers, hr, finance... the place was pumping. "This is great" thought Mike and Nick. "A bit scary, but great. But what should we do? Maybe Ben could help out some more?" Chapter 5: Happy Christmas. Happy Customers. So Mike and Nick and Ben got together (without the 12 kids). Happy days. 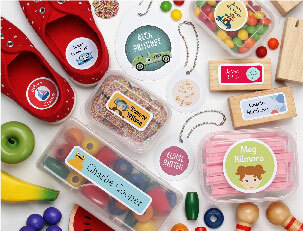 Ben quit his job and made the obvious career move from highly paid city job at the worlds most famous investment bank, to partner in fun at a web based start up making personalised kids stuff (really cute, great quality, awesome kids stuff). The 4th birthday came and went and they headed into Christmas at full pace. Orders flooding in, machines running 24 hours, and more new staff. Would it be too much to handle? Would all those thousands of cute personalised products get to children on time? YES. YAY. Four years of building a great team and great systems meant they finished the Christmas quarter with less than 0.4% late orders (Yep, under 4 late per thousand). Lots more happy customers once again. Yay. (We like happy customers). Chapter 6: Land of hope and glory. From day 1 they’d been sending products all over the world (from the spare bedroom world headquarters). Headquarters was located in the leafy eastern suburbs of Melbourne, Australia and everything was sold from mooo.com.au. In 2011 they decided it was time to really go global. It was time to ditch the .au, time to build a brand new website and to build brand new brand! 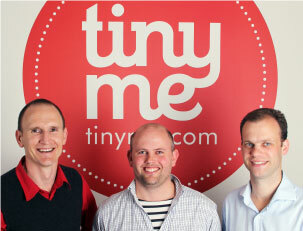 They headed to the UK and tinyme.co.uk was born. The first stop in the global fight against boring kids stuff. 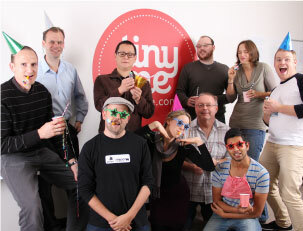 In September 2011 Mooo turned 5 (and tinyme.co.uk turned 2 months old. Yay). The first 5 years have been a very busy time and many plans are underway to make the next 5 even busier. Watch this space. They now had two separate brands in the building selling the exact same stuff. It was sure to end in tears (not that inanimate objects really squable that much, unlike children, did we mention there were now 13 kids? Congratulations Mike and Rach on the arrival of baby number 5). It was time for mooo to hang up its hat and make way for the new brand. With mooo set to retire, tinyme can spread its wings. (After all mooo was 5.5 years old and that's about 125 in ecommerce years!). Chapter 8: God bless America! !